« From Rafe’s desk: What a week! Let me explain what I mean by a third political force in BC politics. Today there are two forces, the Right represented by the Liberals and the Left by the NDP. I do not consider either the Green party or the Conservatives as political forces now or in the foreseeable future. This revelation always makes the Greens unhappy unto tears but when you’ve spent 25 years trying to elect even one MLA you should expert to be seen as a non player. The Conservatives, now down to Christianity and Right to Life, are to me, clearly not a serious factor. Is there room for a third party? I believe that there is for two reasons. 1. The “Centre”, where most British Columbians are, has no party and must vote either Liberal or NDP. This accounts in my opinion for the fact that 50% of the voters stayed home in May ’09. If there were no other factors I would say that there would be room for a “middle of the road” party. 2. There are, however, other factors two in number – the Liberals have disgraced themselves as a government and NDP has been unable to articulate a message “middle of the road” voters find attractive. In my assessment I see two people who could, with a lot of effort, cooperation and financial support, provide a “Centre” party – Gordon Wilson and Chris Delaney but only if they could get together. I mention these two not because I have some relationship with them because I don’t – other than liking each of them. The have not even passed the first test of my friendship – having a couple of beers with me! I believe that both of them have a superior understanding of the issues, are men of unimpeachable character and both have an ability to lead and administer. The edge probably goes to Mr. Wilson because he has electoral and administrative experience, having won two elections and served as a cabinet minister. If, however, they formed alliance and Mr. Delaney were to be the leader, I would give him my editorial support with this caveat – if it appeared to me that someone other than these two looked to be better in leading this Province (which is my only consideration) I would say so. I have no interest in being any part of any Party. I’ve been there and done it. I love my wife, our townhouse in the Village of Lions Bay and our Chocolate Labrador Chauncey too much to leave them for any length of time. Besides that, in 2013 I will be in my 82nd year. I hoe that answers the questions raised on The Common Sense Canadian’s website (www.thecanadian.org) and elsewhere. Thank you, Rafe, for your refreshing forthright and heartfelt commentary. You have indeed answered my question – who would you support in the next election? I too would like to see Chris Delaney and Gordon Wilson join forces and prevent further annihilation of this beautiful province and its natural resources and restore good health and prosperity to its so deserving citizens. The idea that any one leader can be our messiah may be the biggest problem we face. A political party should take direction from an active membership. The same goes for a union, an environmental group and so on – shareholders in corporations included! Starting a party from the top and trying to work downwards towards a membership isn’t likely to produce anything responsive to the public interest. Without active and massive grassroots participation, organizations of all descriptions are soon taken over by self serving, arrogant nitwits who care far more about having power than doing anything intelligent with it. Credit card environmentalists who believe sending their $200 to Sierra Club or WCWC will somehow purify them are like medieval Catholics buying indulgences and believing it was their ticket to heaven and absolved them from responsibility for their sins. The same goes for union members who think paying dues discharges their obligations as members and don’t attend meetings or even learn the basics about their collective agreements, etc. Unions would not exist today had there not been an extremely high rate of participation and will eventually disappear if the present apathy continues. That anti Alcan resolution was brought to the floor against the will, direction, and frantic lobbying of cabinet and party officials. Once it became clear to the powers that be that they had no power to stop it, they just stood aside and there was noone at the “No” microphone! This was the best demonstration I saw in 10 years of very active participation in the NDP, of the members bringing the message from their constituencies and the brass realizing where the power really lies! It was not the only time I saw the party do the right thing against the will of the leadership, but those times became fewer and farther between once the Clark/Sihota gang was in charge. Moe as environment minister treated party members like schoolchildren and helped bully many Green activists out of the party. Moe was one of Gordon Wilson’s main supporters within the NDP which makes me question Wilson’s discretion and commitment to real democracy over backroom powermongering! If we are to make our politics relevant it will require a lot more than a couple of politicians starting a party – it will require tens of thousands of ordinary citizens realizing the elites cannot be trusted to run the show unsupervised! That kind of participation could rejuvenate the NDP; with membership numbers where they are it would likely require 5000 or so new members to tip the balance of power in all or almost all constituencies in plenty of time to establish new leadership and direction before 2013. Your focus on environment as the overarching issue reflects where some of us have been for 40 years and more. Personally I believe we are past the tipping point already and the economic and social upheavals we are heading into will overturn all of the comfortable middle class assumptions about our way of life. We can face the future with eyes open or closed, it makes no difference to nature. The only difference is for us – do we move into crisis consciously and with strength and resolve, or be changed unwillingly by forces we do not control. Urban and suburban armchair enviros often don’t recognize how much their own lives are going to change, like it or not. They understand the concept intellectually but have not incorporated it into their day to day lives, career choices, decisions on where to live, etc. The energy one can contribute as a volunteer has always been limited to what the family can afford. Only the retired, the independently wealthy, or those paid by some interest group or other to participate in meetings, campaigns etc. can afford to be there full time. This allow the paid elites to dominate using delaying and time wasting tactics which soon exhaust the resources of small numbers of volunteers and allow the power hungry few to run the show. Enough grassroots, volunteer participation can counterbalance that strategic advantage and allow the organization to run from the bottom up. In a climate of continued apathy, willful ignorance and lack of involvement, no political system will work for the public interest. The proportional and STV systems proposed as panaceas are even easier for those with large resources to diddle than the party system – as witness Elizabeth May’s hijacking of our process in the Cariboo in the last federal election. Using her strategy, and based on her statements about proportional rep, a federal party could run paper candidates in every riding in the country and use the 4 or 6 or whatever percent of the vote to put the party leader and whoever he/she chooses into Parliament! We had our perennial Green candidate dumped on the eve of the election in favour of a name, Amber van Drielen, which was never attached to any picture, statement, interview, nor visit to the constituency – by May’s statements, so that we “could have a Green candidate to vote for” – notwithstanding we already had one who actually lives here! I’m quite familiar with the Xeni Gwet’in people and can tell you that the psychological impact of the Prosperity situation will have profound impacts on the wider community – the intense and nasty racism from the likes of Walt Cobb was part of the wake up call which turned the story viral and brought massive support for those opposed to the proposal. The people in the T’silqot’in are just starting to realize the impact and implications of all that goodwill as their supporters around the world far out numbered those attacking them. Perhaps the reason First Nations are seen as defenders of the environment has to do with them being extremely attached emotionally and often physically to a long familiar homeland. I know there is a love for the Xeni Gwet’in homeland which also manifested as more and more extreme stress as the threat of destruction loomed. There was no exaggerating how the elders felt and those who scorned or denied that emotion were as out to lunch as they were mean spirited and racist! They are so used to lies, propaganda and bullying that they can’t begin to understand what they are up against and so they strike out with anger and aggression, which is actually very bad for business. 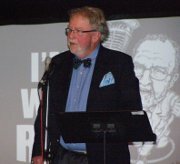 Williams Lake Mayor Kerry Cook among others has realized how bad Walt Cobb and his ilk were making their town look, and is sounding conciliatory and progressive; even Brian “Tony Hayward of the Chilcotin” Battison has changed his tune! If it required giant block letters to help some of these folks read the writing, now they have got it! The Tsilqot’in have given us all a lesson in grassroots democracy as they gave clear instruction to their leaders, who stood for the will of their people and didn’t give in to bullying nor temptation! I agree with you Rafe, that BC needs a third party. I hate the liberals and what they stand for and I don’t believe the NDP has what it takes to lead the province. But Gordon Wilson to me is not a man of unimpeachable character. We all remember his little tryst with Judi Tyabji and his wife’s comment, “I’m still doing his laundry”. A guy who would lie to his wife and family is not a guy I would trust to run the province. I keep hoping someone will show up, but I am getting cynical in my old age. And Chris Delaney is not “centre”. He’s right wing and just waiting for a chance to show everyone. When I think about politics I don’t feel terribly qualified to provide constructive and educated comments. Though I feel compelled today to add some comments about our predicament with the condition of this province’s politcial mess. First off I hear that we as British Columbians have a tendancy to vote against a party rather than vote for a party. I suppose that may not be all bad, but then what are we voting for the lesser of evils? Now when the newly elected leader gets up and says the province has spoken, I want to laugh and say don’t get ahead of yourself old man. We merely told the other guy to get lost and you were the only alternative. So here we are with a Premier who stepped down and possibly because lots of us said good or bad we are not going to have something esle shoved down our throats. Mr. Campbell’s brother Michael was partially correct when he said this protest has nothing to do with the HST, but perhaps moreover how it was how it was delivered. Yes for me if you want to impress me show me where an idea has worked. Has it worked in New Brunswick or in Ontario? Plus how will it help eliminate the ever growing underground economy that doesn’t contribute to our tax base? As current hot topics go theres a good one and has the opposition seized the opportunity to provide us with a plausible alternative as a good opposition party should? Not only have I not seen anything to give me something to look to as another option, but the NDP are at odds and worse have fallen apart. Good grief what a mess. Now back to an earlier point that we as British Columbians tend to vote against the current party, now we don’t really have a viable alternate since the NDP are in such a state. As for Mr. Mair whom I think has been a good source of ideas for me over the years on CKNW suggests a possible third party. Hmmmm. Is it even possible for a third new party to form, organize, set out a platform and be ready for an election battle say in a year? I don’t think I could trust an unproven newly formed group, but hey the voting public has been known to be swayed by such things as charisma and charm before. Alright so what is left for us to choose from a couple of party’s that have not had a real presence or can offer us the needed experience to run this province? Could the Greens or the BC Conservatives run this vast province with all it’s diversity in todays economy? Alas what I feel will be my only real choice when the time comes to vote again might be a revamped Liberal party with hopefully a better, more transparent, and don’t laugh, a trustworthy and socially conscience leadership. Well at least some of them have had much needed cabinet experience. Yes I know sometimes I set my hopes a bit high, but heh it’s my home and I would like it to continue to be the best place to live.